Imagine an alligator — its sleek, scaly body, glistening in the sun as water calmly skims over its back. It waits patiently, tempting anyone who dares to take a dip. The water is so enticing, so warm, why not test it? And in a flash, the alligator catches its prey in a swift bite, its target unable to free itself from its clutches. South Korean group Monsta X heralded their 2019 return with this concept in mind — perhaps an intense image for those unfamiliar with dynamic group. But for those who know them best, like their dedicated Monbebe fandom, it’s a fitting metaphor for the fierce septet. In February, Monsta X, composed of rappers Joohoney (formerly Jooheon) and I.M., and vocalists Wonho, Shownu, Minhyuk, Hyungwon, and Kihyun, made their comeback with Take.2 We Are Here, a high-energy follow-up to October’s Take.1 Are You There? Within the K-pop scene, Monsta X are known for their unfailing duality — sleek and sensual one minute, and then explosive the next. Their signature sound is characterized by high-octane dance tracks, mixed with EDM, hip-hop, and trap. In short, Monsta X are a hypnotic, welcome assault on the senses that have made them stand out since their 2015 debut. And as Korean music has only continued its spread in the West, Monsta X have only continued to sink their teeth in deeper. In 2018, the band embarked on their second world tour, released a mini-documentary with Gallant, and were the first Korean act to perform at iHeartRadio’s annual Jingle Ball. This year, they’ve released Take 2., which features “Play It Cool,” a collaboration with notable DJ Steve Aoki, are gearing up for a third world tour and will be the first K-pop group to ever perform at the iHeartRadio Music Festival in Las Vegas this September. This may seem like a whirlwind of pressure, but to the group’s maknae (youngest member) and rapper I.M., it’s why he believes that this will be a defining year for Monsta X. 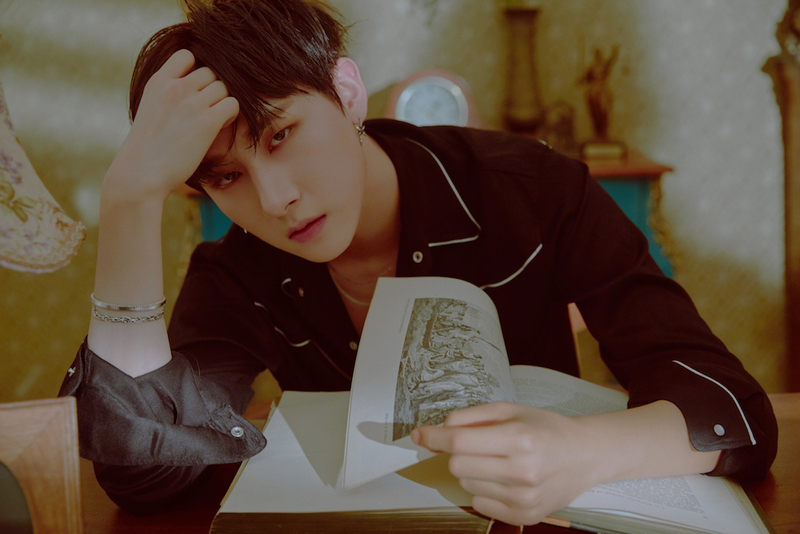 I.M., who is the only member who speaks fluent English, spoke with EARMILK about Take 2., the nuances in Monsta X’s performances, the definition of K-pop, and the group's exciting year ahead. EARMILK: How would you describe the vibe between Take.1 and Take.2? Why did Monsta X settle on the concept of the "alligator"? How did your collaboration with Steve Aoki for “Play It Cool” come about? Would you say there’s a difference between onstage and offstage Monsta X? Who would you say is the most different? Do you guys ever talk about switching up your concepts? Like maybe doing something softer? Or do you want to stick to what you do best? “Yes, sometimes. A lot of people think Monsta X is a very intense group — we have very strong sounds, and the dance moves are very harsh. But we also have the ability to be softer and do more mellow, even sad things. And, you can find moments of that in the album, but we’re definitely thinking of ways to maybe express that softer concept in the future." Who in the group still manages to surprise you, even after having known each other for so long? “I’d say our leader, Shownu. I always think of him as this pillar of strength, like a leader should be, but he has lots of softness to him. He’s also thoughtful and thinks about the other members a lot. And every single time when we drop a new song he fully understands that concept and expresses that energy 100% to the audience. It’s something I really respect." This past year, Monsta X had a world tour, had all those wins with “Shootout,” had a collaboration with Gallant, won at MAMA, and you played Jingle Ball. How do you deal with all of the pressure to keep that momentum going? You’ve been all around the world: what are the differences you’ve noticed between audiences in different countries? “It's really hard to define, but at least in Japan, their reactions are very cute. Especially when we do aegyo — they really like that. They’re also very respectful, like when we start our performance they stand up, and they’re very polite while they enjoy. In South America, the Monbebe’s reactions are very intense. They throw their underwear on stage, they really feel the music. Actually, we learned from our previous world tours that we should change up the setlist in different countries to match their cultures and vibes." How do you get yourself hyped up for your performances? Do you have a ritual? “I honestly am always so excited to perform on stage. I don't really get very nervous anymore. I do have a sort of ritual though, which is that I spray myself with a sort of cologne. It's really hard to explain, but this kind of perfume makes my — how do I say this — heart thump. It helps me get in the right mindset to perform." Monsta X put a lot of thought into styling and taking care of yourselves, which you don’t see a lot of male artists in the U.S. do, especially when it comes to hair and makeup. What would you say to people who feel insecure about being thoughtful about their aesthetic? K-pop is such a visual industry, that it’s no wonder there’s an emphasis on aesthetics. Do you find that the word K-pop — which basically only means music that comes from Korea — is a little bit limiting? Because your music is more than pop. You're mixing hip-hop, and EDM, and more. How would you define what you do? “Our music has a lot of different messages and mixes genres. And I see it really as more of a feeling than anything. I basically define K-pop as a kind of music that satisfies all of your points in your body — satisfying to your ear, your eyes, that you want to sing or shout along to with your voice. And then there’s the social media interaction between fans and artists. I think all of that is the big difference between K-pop and everything else.